The trip up to Bandon from Brookings, on June 25th, was a short drive but with a lot to see. The key part of this drive is the Samuel Boardman Corridor, which is a big state park with multiple places to stop. 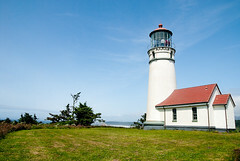 At the same time, it’s hard to tell when that series of wonderful waypoints ends, and the other key places to visit along the way, such as Humbug Mountain State Park or Cape Blanco, with its great lighthouse, begins. It’s just a great stretch of road leading up to a tremendous beach at Bandon. Meyers Beach is a really nice stretch of the Pistol River State Park. I wish I had a photo or two of this beach but because of ridiculous winds and harsh lighting at a bad time of day (we weren’t used to when the light would or would not be good), I don’t have any right now. The sand felt like it would cut skin from the wind. But the stacks are very accessible and have great shape to them. You can really get up close to them. Humbug Mountain State Park is picturesque and lush, but the trail leading up is fairly steep, but consistently so. It can wear out one’s legs in a hurry. The Photographer’s Guide suggested that there is a great deal to photograph in the flat area before the trail starts heading up, but that’s maybe 1/4 of a mile at the most, so one has to be really creative. I’m not sure I was that creative, but some IR photography was fun there. But one really needs to head a lot farther up the trail and the mountain to get much of anything. We moved maybe a mile up the trail but there really isn’t much if one really wants to work at the beginning area. one can walk a bit. This is very different than a lot of lighthouses, which sit basically on a rocky outcropping with very little space. 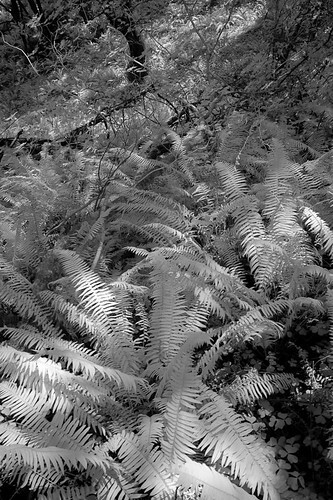 The Cape Blanco area is quite nice, with ferns, grass, and other foliage. The end of the day brought us to the Sunset Motel. On the way, we drove along the Beach Loop drive, which runs along the long, wonderful Bandon Beach. 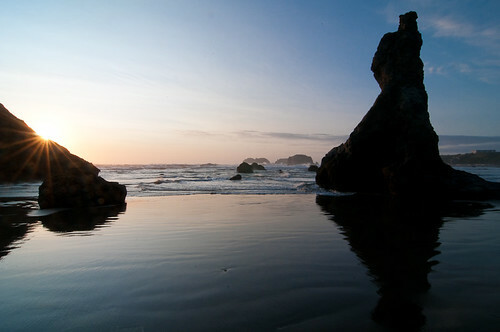 One passes by several access points, notably Face Rock, the one at our motel, and Coquille Point. All along, there are wonderful stacks that are accessible at both high and low tide (so some interesting tide-pool-like action available), and the sand is soft and easy on which to walk. We arrived at Bandon late enough that, after an unplanned nap (ie – we were dead tired) in our room, we faced the issue of dealing with getting dinner and a 9PM sunset running into each other. We lucked out in that the Wheelhouse, which is or is not a good restaurant depending on how one reads the reviews on TripAdvisor, is open until just after sunset. So back to the beach we went. Dinner at the Wheelhouse was acceptable, to be honest. The Cioppino was solid but nothing special (though it was rich in seafood), and my wife’s steak was cooked just about perfectly but was nearly flavorless. Then again, we were the last people in the place and didn’t show up until 9:30 so I can’t complain too much, I guess.